George Karavantos visited the Hellenic Air Force 114 Combat Wing at Tanagra air base, home of the Greek Mirage 2000 delta fighters. Tanagra AB recently celebrated its 40th anniversary of being the “nest” of the Greek Mirage birds. We had the chance to visit and see the aircraft and the pilots of the 114 Combat Wing in everyday operation. Tanagra AB is located approximately 70 km northwest of Athens. It was built during World War II and served as a back-up military airfield during the war. In the past few years, it was reconstructed with the financial contribution of NATO and became a fully operational base of the Hellenic Air Force (HAF). It has a single runway with direction 10-28 and two main taxiways, which can also be used as runways whenever needed. The 114 Combat Wing was formed on the 22nd of August 1956 and it initially consisted of three Squadrons. The first F-104 Starfighters arrived at Tanagra AB in April of 1964 and they kept operating from there until June 30, 1977. On February 16, 1967, the F-102 Delta Dagger arrived and stayed at Tanagra AB for almost 10 years until they retired in the beginning of 1977. The first French fighter for Greece, the Mirage F-1CG, touched down for the first time on runway 10-28 on the 4th of August 1975 and ever since 114CW has always operated Mirage fighters. In March 1985, the Greek government announced the purchase of 36 single-seat Mirage 2000EG and 4 two-seat Mirage 2000BG in addition to the procurement of the F-16C/D Block 30. In 1989 the first Mirage 2000 aircraft were introduced into HAF service and delivered to two newly founded Squadrons, the 331 Mira and the 332 Mira, marking the beginning of a new era for the 114 Combat Wing. On June 30, 2003, the Mirage F-1CG was prematurely retired after 28 years of continuous service. From that point on, 114CW only consists of these two Squadrons operating solely Mirage 2000 delta-winged fighters. 331 Squadron was founded on the 18th of April 1988 for the acceptance of the Mirage 2000 into HAF service. 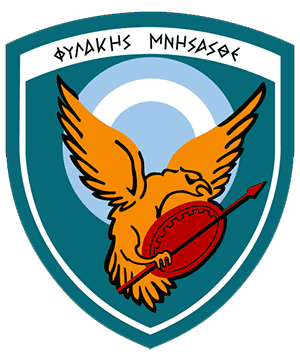 The squadron was named “Thisseas” after the ancient Greek hero and its emblem shows Theseus pointing out a direction that two Mirages follow. The first aircraft landed at Tanagra AB on April 27 and at the same time all the training in different levels by French instructors had commenced. There were also a number of experienced pilots, who were previously selected from other HAF squadrons and had already been trained on the Mirage 2000 in France. The main role of the Squadron was all-weather interception. Despite the previous weapon of choice for the Mirage F-1CG being of the American AIM-9 Sidewinder, this time French missiles were selected for the French aircraft. Procured along with the aircraft, the short-range IR-guided Matra Magic IIs were initially the only missiles equipping the Mirage 2000s. In 1996 the capabilities of the Mirage were enhanced with the short to medium range radar-guided Matra Super 530D. These two air-to-air missiles in combination with the modern self-protection system ICMS (Integrated Counter Measures System) made the Mirage 2000 one of the best and more advanced fighters operated in the region at that time. In 1999, HAF officials decided to order a new anti-ship missile, the AM.39 Exocet. With the addition of this new weapon the Mirage 2000 gained the anti-shipping role, and for this reason the EG/BG were designated EGM/BGM. In 2000, Greece signed a new agreement with Dassault for the order of 15 new-built Mirage 2000-5 Mk.2 fighters. In addition to the new aircraft, 10 examples from the existing HAF fleet were brought up to 2000-5 Mk.2 standard by Hellenic Aerospace Industry using upgrade kits provided by Dassault. These were all single-seat M2000s, the 10 airframes were selected based on their lower level of fuselage fatigue compared to the other single-seaters. The two most important new systems of 2000-5 Mk.2 were the RDY-2 radar and the self-defence suite ICMS Mk3. These two systems became the audit field of extensive testing of the Greek-French team IFEPG (In Flight Evaluation Program Group) which lasted three years starting from the Summer of 2003 in order to determine the compliance of these systems with their specifications. 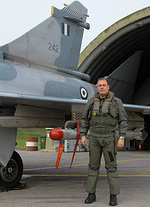 On 24 June 2003 Captain Leonidas Karanatsis became the first Hellenic Air Force pilot to fly the Mirage 2000-5 two-seater. The aircraft serialled 505 was a brand new Mirage 2000-5 Mk.2 used as the development aircraft for the Greek Mirage 2000-5 Mk.2 contract. 331 Squadron was selected to receive the new and upgraded aircraft, giving it a fleet of 25 aircraft. From the initial batch of 40 M2000EG/BG that the HAF had acquired, the remaining fleet after losses and accidents, minus the 10 upgraded ones was around 25 EGM/BGM aircraft. So on the 1st of March 2007 the Squadron handed over all its remaining older Mirages to 332 Squadron, so each would have 25 aircraft. 331 Squadron started to prepare itself for the upcoming type. The new era for 331 began on the 3rd of May 2007 when the first Mirage 2000-5 touched down on the runway of Tanagra airfield. Training followed provided by French personnel and the Squadron became operational again almost a year later. 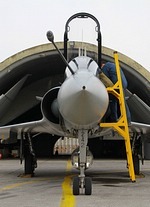 The squadron received the last-ever built Mirage 2000, which rolled off the production line on 23 November 2007. New and more sophisticated weapons arrived along with the new Mirages and these were the advanced air-to-air missile MICA in both radar-guided and IR-guided versions. Also for the first time in the history of the Greek Mirages, a new air-to-ground stand-off weapon, the SCALP munitions dispensing cruise missile, was introduced to the inventory of the HAF. While it is compatible with the 2000-5 Mk.2, the Magic II missile is only being carried by the older EGM/BGM variants since the 2000-5 has the modern MICAs. While it was possible to integrate the Exocet anti-ship missile on the 2000-5, the HAF decided not to proceed with this option, since with the introduction of the SCALP the 2000-5 already has a secondary role. The Mirage 2000-5 Mk.2, offers many tactical advantages compared to the Mirage 2000EG. The Thales RDY all-weather synthetic aperture radar offers increased capabilities compared to the previous RDI of the Mirage 2000EGM. It has the ability to track 24 targets and is capable of simultaneous launch of up to four missiles against multiple targets. It also provides the aircraft with air-to-ground radar capabilities. Other enhancements to offensive systems include a datalink for the mid-course targeting of MICA ER missiles. Other upgrades included the addition of an on-board oxygen generation system (OBOGS), updated secure radio, and digital datalink for tactical information sharing. The Greek Mirage 2000-5 Mk.2 was also fitted with the updated ICMS Mk3 (Integrated Counter Measures System) suite. The Mirage 2000-5 cockpit has with high resolution Multi Function Displays for situational awareness and reducing the pilot’s workload. The pilot has the ability to control most of the necessary functions of his on-board equipment with HOTAS, his hands not leaving from the stick and the throttle. The main visual difference between the Mirage 2000-5 Mk.2 and the Mirage 2000EGM/BGMs is the absence of the pitot tube on the nose cone of the 2000-5 Mk.2 because of the new RDY radome, which also has the antennas of the IFF interrogator. While initially the Mirage 2000-5 could also be distinguished by its hose-and-drogue aerial refuelling receptacle, it was later also added to the surviving EGM/BGM aircraft. Other visually notable differences are the four extra fuselage hardpoints on the 2000-5 for MICA missiles. The initial 40 Μirage 2000s were serialled 200 up to 240 (the two-seaters being 200-204), while the newer M2000-5 serials start from 500. About a year after the Mirage 2000 had entered service with 331 Squadron, the second squadron was formed on the 11th of August 1989. 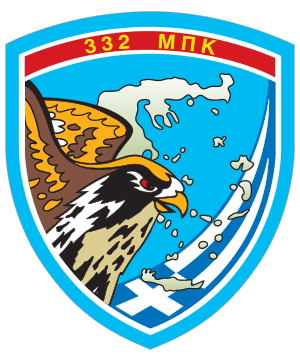 332 Squadron was named “Geraki” or “Hawk” with its emblem depicting a Hawk over a map of Greece with the Hellenic flag in the bottom right. The second Mirage 2000 Squadron mainly used the former 334 Squadron facilities at Tanagra, as 334 Sq had relocated to Iraklion, Crete. 332 Squadron started with Mirages received from 331 Sq along with pilots and mechanics, who trained the new personnel still inexperienced with the Mirage 2000. When 332 Mira reached full operational status on the 15th of July 1990, all personnel was redistributed between the Squadrons so that both could maintain the same level of knowledge and experience. When 331 Squadron started to receive the new Mirage 2000-5, 332 Squadron received its remaining EGM/BGMs. To this day 332 Squadron continues to operate these older versions. The non-upgraded Mirage 2000 EGM/BGMs still have the capability of the Super 530D and to launch the Exocet anti-shipping missile. However, the Super 530D which lacks a CW (Continuous Wave) Illuminator is outdated compared to the other medium range missiles including the MICA-EM of the M2000-5, but also the AIM-120 AMRAAM of the F-16. Despite the complete differences compared to 331 Squadron's 2000-5 in terms of electronics, radar, systems, cockpit and of course capabilities, both are still Mirage 2000s. 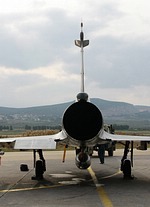 All Greek machines (Mk.2s and EGMs) feature the Thales Totem 3000 inertial navigation system of the Mk.2 with ring laser gyroscope and GPS providing much greater accuracy, reliability, and shorter alignment time than the Mirage 2000 original ULISS 52 navigation system. The fuselage, engine, and many other components of the aircraft are also identical. This helps a lot in keeping both types fully operational as spare parts and similar components can be exchanged between the Squadrons. On the southeast corner of the airfield are the shelters and the facilities of 331 Squadron, while the facilities of 332 Squadron are on the northwest corner. At the end of runway 10 are also the facilities of Hellenic Aerospace Industry, a privately owned Greek company, within the territory of the base. Both Squadrons have two large hangars with space for up to six aircraft undergoing maintenance. Major maintenance is carried out by Hellenic Aerospace Industry. Apart from military and aircraft facilities, Tanagra’s infrastructure also has houses and apartments for some of the pilots or mechanics that are willing to stay on the base. Around 55 families live inside the base. Each family can keep the residence for two years and after that, if there is any need, this can be extended. It is required for the Commander of the base to have permanent residence on the base. Both squadrons are assigned pilots with varied levels of experience. Some of the pilots have previously also flown the Mirage F-1CG or others such as the F-4E, while other experienced pilots have exclusively flown the Mirage 2000 for many years. Depending on experience, each pilot has the opportunity to become formation leader. The formation starts from two aircraft up to eight. The most experienced pilots become instructors or even squadron leaders. Each squadron also has younger pilots, who have recently come from the flight academy of HAF. Therefore the base has two flight simulators, one for the Mirage 2000 and one for the Mirage 2000-5. The 2000-5 simulator offers better graphics and more advanced training, the older Mirage 2000 simulator still teaches the fundamentals. We had the chance to fly the flight simulator of the Mirage 2000-5, and the experience was unique. The aircraft is equipped with an analogue Fly-By-Wire (FBW) Flight Control System (FCS) consisting of four computers. The Mirage 2000 has a different philosophy in terms of flying in comparison to most aircraft. Despite the fact that it is a fighter, the aircraft always flies with Autopilot engaged. Immediately after takeoff, the pilot engages the Autopilot. The system has the ability to auto trim and keeps the aircraft at the attitude that the pilot wants. On the stick there is a latch that the pilot can press at any time which deactivates the autopilot. He can set a different attitude and then release it again and the Fly-By-Wire takes care of the rest. The experienced Commander explained to us that this philosophy is the same as on the preceding Mirage F-1C. The FCS constantly monitors weight and flight parameters and prevents the pilot from overstressing the airframe. The FCS of the Mirage 2000 is programmed to allow 9G manoeuvring and a roll rate of 270°/sec when configured for air-to-air combat. The stick of the Μirage 2000 has two mechanical stops for pitch up. If you pass the first back-stop, the Angle of Attack limit is disengaged and by increasing the force on the stick you can increase AoA from 29° to 31° or in terms of G forces pulling from 9G up to 11G! Each squadron has two-seat aircraft for live training which cannot be replicated by the simulators. Every year all pilots must be requalified in IFR flight and in tactical manoeuvres. 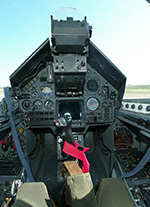 The former is carried out using the simulator, but for the tactical manoeuvres a live flight with a two-seat aircraft is necessary. Apart from the training flights, the base maintains two or three pairs of fully armed aircraft on stand-by for any potential hostile encounter. The readiness of these aircraft is 60min down to 5 min. 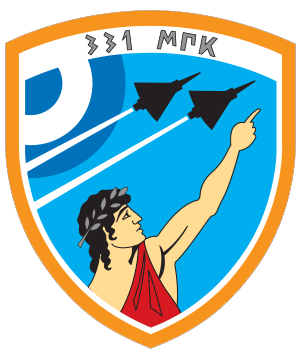 Depending on the availability of the aircraft and in cooperation with other Combat Wings of the HAF, the Squadrons also on a rotational basis deploy two aircraft along with 3 or 4 pilots to the 133 Combat Group based at Skyros island for security coverage of the central part of Aegean Sea. When at Skyros, a higher level of readiness is maintained, over there even lower response times are achieved with the pilot awaiting orders while seated in his aircraft. The workload of the 114 Combat Wing is quite heavy as 331 Squadron has one of the two most modern fighter types in the HAF, but also because the Mirage 2000 is the only fightertype in HAF service that is not also flown by Turkey. There were more than 6 sorties of two or three aircraft on the day of our visit. Four during daytime, while there were two sorties for night training. Greek Mirage 2000 upgrade: real or only a "Mirage"? In early 2016 the Supreme Air Force Council approved the upgrade of the remaining 17 single seat Mirage 2000EGM (the two BGM are near the end of their structural life) to a standard close to the -5 Mk.2 standards. The Greek Mirage 2000 upgrade consist of three main aspects. The first is the replacement of the RDM-3 radar with the RDY-3, similar to the Indian Mirage 2000 upgrade program. The new RDY-3 is a model based on the compact Thales RC400 first introduced in 1999 for lighter aircraft and used for the upgrade of the Moroccan Mirage F-1CH/EH. The unit has 20% less range than the RDY-2 of the Mirage 2000-5 Mk.2, but it is 50% lighter, around 115kg. Combined with a bigger antenna possible on the Mirage 2000 the powerful transmitter still provides a range close to that of the RDY-2. The second aspect of the upgrade is a new mission controller. The most probable scenario is to acquire the Modular Data Processing Unit of the Mirage 2000-5 Mk.2 also used by the Rafale. The third aspect of the package is the upgrade of the existing self-defence suite ICMS (Integrated Counter Measures System) from Mk1 to Mk3 standard. If the upgrade program is implemented, additional MICA missiles will not be necessary as the HAF already possesses 300 of these missiles in its inventory, giving a ratio of 6-8 missiles per aircraft compared to the current 12 for only the -5 Mk.2 aircraft. In either case, the ratio is still larger than that of the AMRAAM for the F-16s and F-4E AUP Phantoms. The upgrade program does not cover the Inertial Navigation System (INS) as the newer Thales Totem 3000 INS with Ring Laser Gyroscope (RLG) had already replaced the old Sagem ULISS 52E on the Mirage 2000EGM. Due to financial crisis in Greece, the big question is when this upgrade program will become a reality. The French side is putting a lot of pressure on the Greek officials because the production line of the systems and other parts are currently open for the current upgrade program of around 50 Indian Mirage 2000H/TH. Once the production lines are closed, it may become financially impossible for the Greek Mirages to be upgraded to -5 Mk.2 standard. There are rumors that Greek government wants to offer the remaining F-16 Block 30s for sale to other Balkan countries that are seeking affordable western options to modernize their fighter fleet. Despite the fact that many HAF officials would totally disagree, the truth is that Greece has no other option to fund the upgrade of the Mirage 2000 and the younger F-16s. The Mirage 2000-5 Mk.2 along with the F-16C/D Block 52+ are the most modern fighters in HAF service. If upgraded, the EGM/BGM aircraft that are now 25 years old will soldier on alongside them, but due to the financial crisis in Greece nothing is for sure. The personnel of 114CW do their best every day to keep each squadron fully operational and, for the Combat Wing in general, maintain the highest level of proficiency and professionalism. For the men and women one thing is certain, no matter what problems they, their own families, or their country faces, they must be ready to defend their homeland. That’s their duty, and we have seen and realized that they successfully do so each and every day. Special Thanks go to the Commander of the base, Colonel Athanasios Ganas for his great hospitality, and also to Colonel (Retired), nowadays Captain Leonidas Karanatsis, member of the IFEPG for the Mirage 2000-5 on behalf of the HAF.